Unlike the Windows version of VMware Server, the VMware Server Management User Interface (MUI) is a separate installation component in the Linux version. This tip details how to obtain the MUI, how to install it, how to secure and configure it, and how to log in. In the last section, we configured and secured Linux. Now it's time to work on the Management User Interface. Unlike the Windows version of VMware Server, the VMware Server Management User Interface (MUI) is a separate component to be installed in the Linux version. 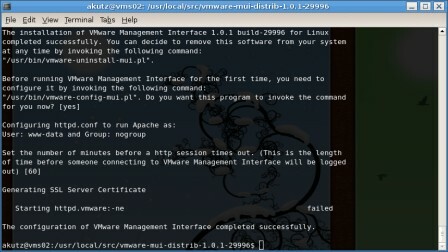 This section details how to obtain the MUI, how to install it, how to secure and configure it, and how to log in. You should have downloaded and unpacked the VMware MUI tarball when you downloaded the VMware Server tarball in Step VI.A. You will notice that the VMware Server MUI http server failed to start. This is because it is misconfigured for Edgy Eft, and we need to make some manual changes in order to make sure that it will function properly. Now let's look at how to configure. There is a small problem. The file we just edited will get replaced with a "clean" version the next time the server reboots. We have to edit the "clean" version so that it has the above changes as well. The file we need to edit is /usr/lib/vmware-mui/src/lib/httpd.vmware. Apply above changes to this file as well. Now the next time the server reboots the changes will be preserved. The above command will back up the httpd.conf file to httpd.conf.bak and will then create a new httpd.conf file, replacing all Listen directives so that they will be replaced with Listen directives that include the IP address of the management interface NIC in addition to the port. We also need to make this change to the source file for httpd.conf. To do this, change the directories to "/usr/lib/vmware-mui/src/apache/conf". Now execute the exact command we used to do the initial replacement. That's it. We are finished modifying httpd.conf. Now the VMware Server MUI will only be listening for incoming connections on the management interface. You should now be able to point a Web browser at https://MGMT_NIC_IP:8333 and see the server's VMware Server MUI. However, there are few things to consider. Once you set a password for the root user, you will be able to log into the MUI with the root account. Only users that have privileges on VMs can log into the MUI. That means that although you may have a user on the server where VMware Server is installed, you will only be allowed to log into the MUI if your user account has execute privileges on a VM's vmx file. We will discuss file permissions and what they mean to VMs later. The Windows version of this guide had no dedicated VMware Server Console section, because installing VMware Server on a WindowsServer would also install the console, and an administrator could immediately start playing around with VMware Server through that. Because we have installed VMware Server on an Ubuntu installation without X windows installed, we will need to install VMware Server Console on a separate computer. For the purposes of this guide, I will be installing VMware Server Console on an Ubuntu 6.10 (Edgy Eft), normal desktop installation. It is quite easy to obtain the bits for the VMware Server Console. Just point a Web browser at the VMware Server, https://MGMT_NIC_IP:8333/ and the Web page that comes up will present you with a drop-down menu that lists the different versions of the VMware Server console. Select the version for Linux that is labeled "VMware Server Console for Linux (tar.gz)" and click on the button labeled "Download". Once you have downloaded the tarball, open a shell and change directories to the location of the download. Deflate the tarball and then, as I recommended earlier with the VMware Server and VMware Serve MUI source directories, rename the directory from "vmware-server-console-distrib" to "vmware-server-console-distrib-1.0.1-29996" or whatever version it is. This will help keep straight later versions of the VMware Server Console you might download. The installation is straightforward and it is fine to accept all of the defaults. The first step to connecting to the VMware Server server is to launch the newly installed VMware Server Console. If you are using GNOME or KDE, the installer will create a shortcut for you in your system menu. You can also launch the console by typing "vmware-server-console" from a shell (it is in /usr/bin, so it should be in your path). When the VMware Server Console is started, it will ask you for the host name you would like to connect to. Enter the IP address of the management NIC on the VMware Server server. It will also ask for a user name and password. I have not confirmed this with VMware, but it appears that any user that exists on the VMware Server server can log into the server via the VMware Server Console. I tested this by creating a user from scratch; I did not set a shell for this user, create a primary group for this user or even create a home directory for this user, but this user was able to log in via the VMware Server Console. Once you are connected to the remote server, proceed to the next section for instructions on how to create your first VMware on Linux VM.